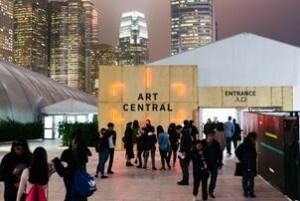 The second edition of Art Central has been a remarkable success, with over 32,000 buyers, collectors and members of the art-loving public flocking to see Hong Kong’s most dynamic contemporary art fair. 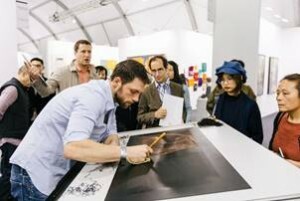 With First Night (Monday 21 March) attracting 4,500 guests eager to be among the first to see the fair, Hong Kong Art Week was welcomed in style. In its second edition, Art Central displayed a distinctly Asian edge with an ambitious program that included large-scale installations, engaging panel discussions and performance art. 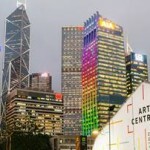 Over 100 galleries were on show in the architect designed temporary structure on Hong Kong’s Central Harbourfront, 75% of which were from Greater Asia. From the talks program to the curation of experimental film, the spotlight was firmly on Hong Kong as a global center for contemporary Asian art and visitors were encouraged to explore, discover and redefine their boundaries. “It’s this difference that collectors, buyers, the art-loving public and our galleries have so enthusiastically embraced. With many galleries reportedly having sold works to buyers they have met for the first time at Art Central, the fair is creating new opportunities, connections and experiences at many levels,” said Tim. In 2016 Art Central launched three curated projects, MEDIA X MUMM in partnership with G.H Mumm Champagne, ROUNDTABLE X 4A(curated by 4A Centre for Contemporary Art, Sydney) and SCREEN X EXPERIMENTA (curated by Gina Wong Director of Experimenta, Hong Kong). These projects reflected the new media theme of the 2016 fair and highlights included durational performance ‘The Flying Buck’ by Abdullah M.I. Syed within ROUNDTABLE X 4A which brought to the fore inherent narratives of institutionalism, capitalism and consumer culture, particularly in the context of the art market and the force of economic powers within. Taiwanese artist Ting-Tong Chang who is represented by Christine Park Gallery, London, was announced the winner of the 2016 RISE Award sponsored by J.Crew and was recognised as the most promising emerging artist. Ting-Tong Chang’s drawings and animatronic sculptureRobinson pays particular attention to the relationship between science, technology and society engaging and questioning the concept of contemporary utopia. Chang also presented a site-specific durational installation and live performance The Colosseum which explored two interrelated issues: the truth claimed by art and the logic of spectacle. The 360 degree painting depicted the Art Central fair as created over the course of the six day fair. Gallery highlights included Sin Sin Fine Art (Hong Kong) from the host city, a new gallery addition, presenting a dual show by Indonesian artists S. Teddy Darmawan and Bob Yudhita Agung, two artists of different backgrounds yet unified by their spontaneous yet powerful expressions on how they survived life’s challenges. GALLERY HYUNDAI (Seoul) presented a cohesive selection of Korean monochromatic paintings including museum quality works by Park Seo Bo and Lee Ufan; Richard Koh Fine Art (Kuala Lumpur) presented Haffendi Anuar, Saiful Razman, Wong Perng Fey and Yeoh Choo Kuan as a focus on Southeast Asia; Gana Art (Seoul) presented five Korean artists within a curated show titled Beyond the Visible; Hive Center for Contemporary Art (Beijing) highlighted generations of contemporary Chinese art with names such as Shang Yang, Liang Quan, and Wei Dong;TEZUKAYAMA GALLERY (Osaka) exhibits Hirohito Nomoto, Kazumi Nakamura and the work of multimedia artist Satoru Tamura and Red Gate Gallery (Beijing) presented a Chinese contemporary group show that includes Li Xiaofeng, Ye Sen, and Zhang Zhaohui. International names included, Michael Goedhuis (London, New York) presenting the aesthetic trajectory of ink artists from classical works by names such as Liu Kuo-sung, through to mould-breaking avant-garde paintings by Qin Feng; Schuebbe Inc (Düsseldorf) exhibited an international group show with 50’s German artist collective SPUR (Helmut Sturm, HP Zimmer, Lothar Fischer and Heimrad Prem) alongside emerging artists Nashun Nashunbatu, Tianhong Sheng and Christian Schoeler; and Galerie Forsblom (Helsinki), a new addition to the gallery line-up this year, featured works from Manolo Valdés, one of the most established contemporary artists of Spain whose work is included in prestigious collections such as the Metropolitan Museum of Art and the Museum of Modern Art in New York.